The basalt lava flow extruded from the base of Sunset Crater around 1180 A.D. The flow surface consists of pahoehoe, slab pahoehoe, and aa. 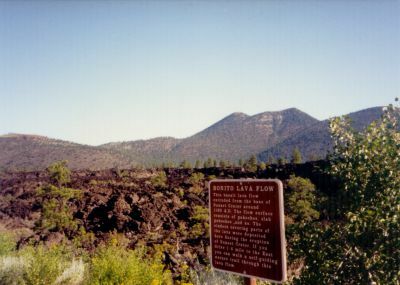 The cinders covering parts of the lava were deposited here during the eruption of Sunset Crater. If you drive 1.4 mile to the east you can walk a self-guiding nature trail through the lava flow.